Beaulieu is a multi-attraction property, where visitors can see Lord Montagu's stately home, the ruins of the medieval abbey that preceded it, a huge model railway, a monorail and the National Motor Museum. The Palace House, on the edge of the New Forest, was originally the 14th C. gatehouse from a Cistercian Abbey, that destroyed during the Dissolution of the Monasteries. It was subsequently extended into the present manor house in the 16th C. Behind the house are the ruins of rest of the Abbey, circa 1246. Its refectory was converted to a Parish Church following the Dissolution. A 'Secret Army Exhibition' tells how secret agents were trained at Beaulieu during WWII. The National Motor Museum, located nearby, contains over 250 vintage cars from Peugeots to Daimlers. You will also find vehicles once owned by celebrities and cars that broke speed records. A traditional pink Elizabethan manor house, built in 1583 on the edge of the New Forest. It was bought in 1748 by Sir Edward Hulse, physician to Queen Anne, whose descendants still live there to this day. Set in beautiful gardens and parkland, and surrounded by fields. The magnificence and grandeur of the house has changed little during its 430 year history. 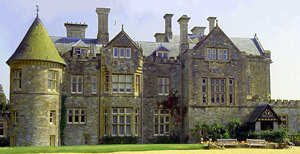 The house was used as a filming location for "Churchill at War", "The Woodlanders", "Children of the New Forest" and "Florence Nightingale". There is a small Countryside Museum in the grounds, displaying a wide range of traditional farming tools and machinery. Includes a children's playground. Facilities: Parking, cafe, toilets, shop, children's play area. The distillery is based in the historic Victorian and Georgian Laverstoke Mill, by the River Test. The ancient recipe uses 10 specially selected botanicals that give Bombay Sapphire Gin its crisp, pure and elegant taste. 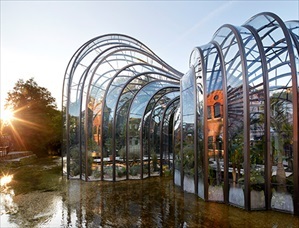 Take the self-guided tour of the mill and experience first hand the distillation techniques used to achieve its unique taste. Then sit back and relax with a free cocktail at the Mill Bar. Romantic crumbling ruins of a medieval palace, once the seat of the Bishops of Winchester. Nearby restored farmhouse contains a museum about the reign of Winchester Bishops. This grand Gothic style pinnacled mansion is built on a very ancient site, once recorded in the Domesday Book. It has been owned by the Carnarvon family since 1679. The current house was constructed in 1842 to designs by Sir Charles Barry - the architect who designed the Houses of Parliament, Westminster, London. The Castle houses an Egyptian exhibition, which commemorates Howard Carter's 1922 discovery of the tomb of Tutankhamun, in the Valley of the Kings. The Castle, its grounds and the exhibition are only open to the public during Easter and May Bank holidays, and during the summer months (July to September). The castle is also available for private events such as weddings, corporate events and film locations. 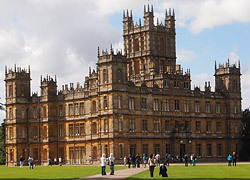 The latest production is that of 'Downton Abbey', a Edwardian drama series set in 1912, shown on ITV1. Facilities: Parking, café, gift shop, toilets. 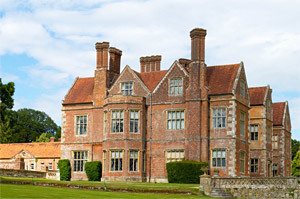 Just 1 mile south of Alton, in the small village of Chawton, stands the charming 17th-c. red-brick home of the novelist Jane Austen, where she lived from 1809 until her death in 1817. It was here that she wrote the final drafts of her six novels, Sense and Sensibility (published in 1811), Pride and Prejudice (published in 1813), Mansfield Park (published in 1814), Emma (published in 1815-16), Northanger Abbey and Persuasion (published after her death in 1817). The house has been preserved as a museum, which celebrates here life and works. The drawing-room contains the novelist's work-table and first editions of her books, the other rooms contain some of her letters and personal possessions. Facilities: Parking, café, restaurant, picnic area, shop, toilets. 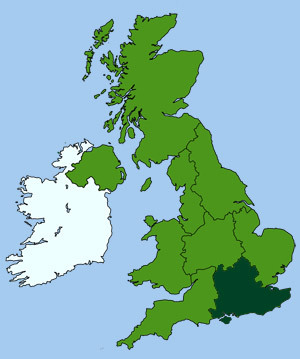 The New Forest is actually quite old - it was created in 1079 as a royal forest by William I, for his private deer hunting. It has been subject to strict forest laws from Norman times until 1640. The Knightwood Oak in the New Forest is stated to be the largest and oldest oak in all England. New Forest ponies are a small, hardy breed, who wander freely through the forest glades and villages. Viewing points, picnic areas and parking lay-bys are available throughout the forest. Maps of trackways, walks and cycle routes are available from the New Forest Centre. The New Forest Centre located in the town of Lyndhurst tells the story of the New Forest, its history, traditions, character and wildlife, with audio visual displays. Events and exhibitions run throughout the year. Built in the 3rd C. Portchester is probably the best surviving Roman fort in England. Refortified in medieval times, the castle is renowned as the place in 1415 where Henry V rallied his troops before setting out to do battle in Agincourt. A unique collection of hundreds of guns	and cannon, located in a restored Victorian fort overlooking Portsmouth Harbour. Built in the 1860s against a threat of invasion. There are secret tunnels, underground chambers to explore. Daily guided tours	and gun firings. This stately near Reading, has been the seat of the Dukes of Wellington since the nation presented it to the first Duke. His victories over Napoleon are commemorated here, and there are many Napoleonic souvenirs - furniture, books, paintings, even clothes. In the house and the museum outside there is a fascinating collection of Wellington memorabilia, including his false teeth, death mask and locks of hair. One of the most outstanding exhibits is the huge funeral wagon on which his coffin was drawn by 12 horses. A 140 acre Zoo, with over 250 exotic and endangered species, within landscaped surroundings. Includes adventure playground, Encounter Village, picnic area, plus 16th and 17th century style formal gardens. Facilities: Parking, restaurant, picnic area, shop, toilets.